In America today we are experiencing an economic environment that is absolutely amazing one day, and the next not so good. While the current progression of jobs being created has consistently been on the positive side, there are specific occupations that will always be needed in society. Every building whether it is an apartment, house, or commercial facility all have one thing in common… air conditioning and heater systems. Typically most individuals and industry professionals shorten down the latter to HVAC (which is what we will do today). The HVAC industry, in general, is a pretty technical field to be in due to the knowledge skills one needs to have to perform their jobs appropriately. While no one is actually obligated to be a part of career fields that are essential to the entire society’s necessities, doing it upon your own will is more satisfying than anything else. As the old mantra states “if you love what you do you will never work a day in your life.” It is easily noticeable that when someone loves their job that they are typically happier on a daily basis in addition to performing on their job as well. Being able to fully comprehend and understand the proper skills it takes is more important than just what is in front of you. Not only will you be able to complete your duties as a HVAC technician appropriately on the job, but if you (or a loved one) ever have problems, you will be the person for the job. The vital lessons and skills you learn will be worth more than your regular paycheck (not to say your paychecks are not great because they are)! In this article we are going to cover all of the information one would need to know when it comes to entering this field in the state of Nevada. The education level that you would need (including specific courses), certifications, specific state requirements, what exactly you will learn while you are in school, the salary range that you can expect, and more. We want you to leave this article understanding exactly what it takes to become a successful HVAC professional. Just like any other state or profession that requires extensive skills, being an HVAC technician/professional requires their professionals to meet specific requirements. These requirements are put in place to ensure that you are certified to do you your job appropriately. While no one is technically perfect, in the career field of HVAC, it is of the utmost importance that you make as little mistakes as you possibly can. Making mistakes as an HVAC technician is more detrimental than what one would think in another profession. As you begin to work on HVAC systems you will be dealing with electrical circuits, chemicals, and other equipment parts that if mishandled could cause grave harm to you and/or those around. It is also crucial to minimize the mistakes that you make because if for any reason you are held responsible, the effects will domino down to everyone. The company you work for (or your own, which we will touch on a little later) will be held liable for any additional costs, maintenance, and/or repairs that will need to be completed because of your mistake. The latter will also cause for the reputation of said company to possibly be hurt. Negative reviews tend to spread around quicker than positive reviews. In the state of Nevada you are required to receive specific training/education, proper licenses, and pass certification exams. While the requirements may seem a bit extensive, remember that they will be well worth it in the end. As a Nevada resident seeking to become an HVAC technician, you are required to complete an undergraduate level training course. This will have to be completed in a Nevada HVAC training program. In regards to the timeline of these programs/degrees, you will notice that it can take a few months (which will be converted into credit hours) or traditional setup of 2-year programs. On a general standpoint, one of the certifications that all HVAC professionals need to obtain is the EPA Section 608 certification. The EPA Section 608 Certification is obtained by taking a standardized exam, which will test your knowledge and hands-on work. At the moment, this test can cost up to $150 to take (however, it is important to check your institution as the price can be subject to change at any moment). Currently, there are a variety of HVAC schools available for you to choose from in Nevada. All of the following schools are recommended to any prospect. Nonetheless, it is vital that you pick the option that you firmly believe is best for you (and of course your tuition budget). These colleges all offer certificates and 2-year associate degrees. It is up to you to choose the program best suitable for your career goals. Each college encompasses its own unique capabilities, environment, teachers, and student size. Choose what you know for a fact will be the best scenario for you to learn in. Overall, being in a school that makes you feel confident every single time you step on campus. Your goal is to receive the best grades possible and learn as much as you can before stepping into the field, not just enough to pass/graduate. While these colleges listed above are great options, it is understandable that many individuals simply don’t have the funds to pay for it. As stated earlier, the economy is not in the best of situations. If you would rather go straight into the career field instead of taking general classes, there are trade programs available that you can also enroll in to become a certified HVAC technician. These programs can take between 3-6 months to complete. Of course it is recommended that many students attempt the 2-year college programs for the sole factor of our current economic and job environments. The competitive job market alone make it pretty hard for individuals to whom have certificates to prove that they are better than those with 2-4 year college careers (on paper). It is crucial that if you take the route of trade programs (which is completely fine) you always put your best foot forward. Contrary to belief, it is understandable that some students actually prefer large classes over smaller ones. Large classes can release some of the anxiety of thinking you will always be put on the spot to answer a question. It also plays to the best abilities of working with your peers on a more consistent basis. However, if you are the type of student that thrives off of small classes, by all means stay confident in that situation too. Just like in any school and any profession that exists, the beginning of your trade program/college career will cover the basics. In your HVAC program/classes, you will begin to build (figuratively and literally) the foundation of the lessons you will need in the work field. In the end, everything will come together and make sense to you. Your training (including books, homework, and hands-on projects) will all encompass the following traits. Mechanical Skills: This should definitely go without saying, the main element of your job is working with mechanics! The lessons you will learn will guide you towards the overall goals of repairing, installing, and checking for any vital/alarming signs. Being an expert in this area is going to make your life (and career) a breeze. What you should always keep in mind is that technology is always evolving now and days. The quicker you can adapt to the new/consistent changes, the better it will make you look. Troubleshooting skills: It goes without fail that heating and air conditioning systems are not 100% guard proof. Although the system(s) may not completely broke down, there will be some times when trouble-shooting is a solution. The solution of troubleshooting can cost little to know money at all. Being able to detect a small problem immediately before it actually becomes a big problem will help you standout to clients. Troubleshooting skills are verbal and physical solutions. Verbal because you can relay to your client(s) the solutions that they can implement on their own without having to call you (the HVAC technician or another) every time this happens. However, if it does require your physical hands-on expertise… that is why you will be the professional to call on. Intricate organization: In this profession, you are bound to handle a variety of tools, parts, and pieces on a daily basis. Keeping this in mind, it is in your best interest to always stay as organized as you possibly can. Organization will simply save you a lot of time and confusion on your way to the job and the job (at the client’s location). Education/certifications/licenses: Although we have discussed the intricate details of your education earlier, it is never wrong to reiterate its importance. Unlike your school setting, the work that you will be completing is not for a grade. It will be for real clients, in real life situations with no teacher/professor on your side to help. All of the hours you will spend working at school and at home for homework, all of the tests you will take (and ace) should always be in the back of your mind. Remember, the one thing that you cannot gain back is time. Make sure that you utilize the skills you have learned obtaining your education, certifications, and licenses. Your overall physical strength: Being an HVAC Technician is a hands-on profession. While you may think of your job as just adjusting, cutting, and installing parts to a heater/air conditioning system(s), somebody has to carry these parts and equipment right? There may be some days where you only carry circuit boards, wires, and your essential toolbox… and there may be some days where you have to remove/install these new and old systems. It all depends on what your client will need. Time-management skills: As a professional, it is not necessary that you think of this job as a race. As stated earlier, you definitely want to make as less mistakes as humanely possible. In the same token, as a professional you should not take longer than necessary. There may be days when you have multiple clients on your schedule. It is your duty to make sure that you can stay on your daily schedule at all times as it not only affects you, but your client’s schedules as well. Customer service skills: Last but not least of course is polishing your customer service skills. At the end of the day, you are providing labor and services to clients. You should want to be known as the HVAC technician that is nice, helpful, dependable, and easy to work with from your client’s perspective. The better you can provide them the necessities they pay you for, the better your reputation will be. Your reputation can end up determining pay raises and promotions in the long run. In Nevada, you can expect to make a pretty decent salary as an HVAC technician. On average, the median amount of money that professionals in this position make is $31,000 a year. Now that is not bad to look at especially coming straight out of school. Nonetheless, you should make that your inspiration and motivation to do better. The more successful you become in your career, the more money you can make. With Nevada being home to one of the most popular cities in the country (Las Vegas), there will always be some type of work that needs to be done. The more you work, the more work you will have under your belt. Overall, we hope that you look at all the information we have shared with you as a great reference you can look back on every day. Take into consideration everything you have learned here. 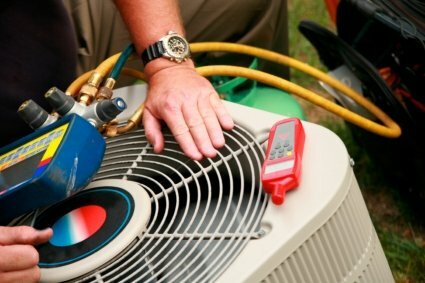 In due time you will obtain all of the necessities you need to become a HVAC technician. Learn what it takes to work for a HVAC company including hospitals, corporate offices, schools or even start your own business. At ATI you’ll get hands-on training and can be completed in around 11 months. The campus is located at 5150 S. Decatur Blvd, Las Vegas, NV 89118. ATI provides students with resume preparation, interviewing techniques and can even connect you to potential employers. Are you located in Sparks, NV and have wanted to start your career training in HVAC? Career College of Northern Nevada offers a 36 week HVAC training program just for you. Learn about water supply lines, how to maintain systems, electrical writing and controls and even customer service skills that you’ll need on the job. Their campus location is a 1421 Pullman Drive Sparks, NV 89434. Start your HVAC training at Quality Technical Training Center in Las Vegas. They offer a 144 clock hour, 12 week training program and offer morning, afternoon and even evening classes. The classes are 3 hours per days and financial aid is available. Their campus location is 3139 Westwood Drive Las Vegas, NV 89109. You can fast-track your career training at NTI with a 4 month HVAC certificate. They are approved training provider for Workforce Investment ACT Grants Licensed by the Nevada Commission on Postsecondary Education. Their campus is located at 1870 Whitney Mesa Drive Henderson, NV 89014. A quick job search resulted in over 40 current companies just in the Las Vegas area that were looking for HVAC technicians. After reviewing all of them below are what we found in terms of what they required as well as salary ranges. -	Years of Experience: This is one of the hardest things to overcome if you just graduated from an HVAC school is you typically don’t have the number of years of experience that many companies require. Don’t let this be a deterrent as many industries have similar requirements. What I always tell graduates is the number of years is just what the company would like but it doesn’t mean they won’t consider you if you don’t have the years. Be sure to apply for all the jobs in your area regardless. -	Certificates: Many of the trade schools we researched offer additional certifications you can obtain while attending school. Some schools will want you to take a test after you graduate to get your EPA certification (which is highly desirable) in Nevada and we urge everyone to get this certification. Another is any solar or even electrical certifications. Many electricians end up going into HVAC as they are highly skilled in electronic equipment and more and more HVAC units are becoming computerized. -	Driver’s License: Because you’ll be driving to different locations many companies will provide you with your own service truck. One of the things that all companies will require is a valid Nevada driver’s license but they always want you to have a clean driving record. If you have tons of speeding tickets, wrecks, insurance claims, etc they will more than likely pass on you once they run your driving record. Although Las Vegas was the top area in Nevada that had the most job openings when we looked other areas included Reno, McCarran, Henderson, Sparks, Incline Village, Elko and Spring Creek.